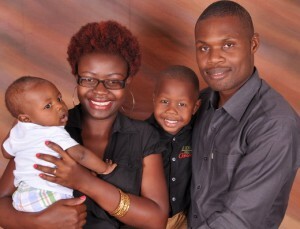 Biography: In 2013, Forward Church Nairobi was established. Ongata Rongai began in the late 1940's as a cattle market and stone mining township. The majority of the young people lack income and spend most of their time smoking weed near a river. The church was built near this river. In less than a year, the church membership has grown from 10 to 38. George and Leah's vision is to "Establish hearts in God's amazing grace and unconditional love." They desire to set people free from fear and create a faith and love based relationship with God by preaching and teaching the true nature of God. Strengths: George describes himself as a team player and teachable. He and Leah are teachers and have a passion for outreach.